Since they were first announced to the world, personal electronic organizers have come a long way. When personal computers first came into being, the world celebrated the new compact size of what was then regarded as a powerful machine. The individual nature of the PC 'box' compared to the previous use of mainframe for computing purposes meant that for the first time the individual end user had a computing environment that he/she could control. The most important ability of a personal computer was that information could be kept on a pc that had previously only been kept in written form. It is not practical to carry around a 50lb package though, and the manufacturers of electronic equipment soon came up with a much smaller portable system. Enter the personal electronic organizer. Large, cumbersome, and weighing in at 2lbs, these organizers were uncomfortable to use. While keyboards were large enough to type on, the rest of the package made them unpleasant to use. Palms were soon introduced, and from there, immense progress was quickly made. As technology advanced, the components that go into the manufacture of pcs got smaller. This had the effect of exponentially increasing the internal capabilities that these organizers boast. Larger storage capacity and faster internal processing power has meant an improved service, color management and, these days, the ability to store gigabytes of data such as music and movies. Web information can also now be downloaded directly from the internet into the memory of the organizer itself. These organizers contain all the basic info you need such as diaries, contact lists, and calendars. They also contain other nice to have abilities such as: games, alarms, calculators, and even space to create ready to print documents. They store and play music and films, and have more ROM than the computer that took the first astronauts to the moon. 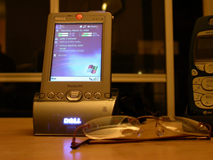 The larger models of these organizers are complete personal computers in their own right, complete with hard drive, Bluetooth capability for file transfer and 64 bit color. They come with built in speakers and microphones for audio, and run operating systems which make them very end-user friendly, and even securely encrypt your data so that it stays personal to you. Your electronic organizer these days will automatically synch with your home PC, remind you of your loved ones' birthdays and those important anniversaries, and while they will set you back between about $30 and $300 they are only around 4oz in weight. IMSL software - This site encompasses IMSL Software's reviews, which are based on several years of using and supporting these devices. Epinions - Epinions offers personal user opinions. These are typically both techy and non-techy type people offering their honest opinions. Photo courtesy of James Lin may not be copied, reproduced, or sold.